The Global Jet Watch project was designed and set up by Professor Katherine Blundell OBE in order to investigate and understand the behaviour of black holes. Black holes give rise to spectacular phenomena across the Universe, both at the hearts of powerful quasars at the centres of galaxies and throughout the discs of galaxies such as our own Milky Way. An innovative feature of this project is that it takes advantage of the rotation of the Earth: by commissioning telescopes around the world, separated in longitude so that there is always one of them in darkness and thereby can take data on our black hole targets. 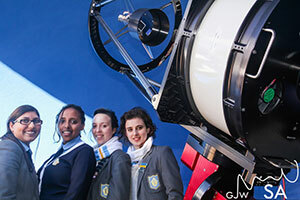 All five of the observatories are commissioned and delivering spectacular data around the clock and four of these five are established in boarding schools in order, in particular, to engage girls from around the world in this exciting science project. We seek donations to especially develop the educational strand of this project.